The national State of Environment (SOE) report is based on a deep analysis of trends. It provides an understanding of policy implementation efficiency. 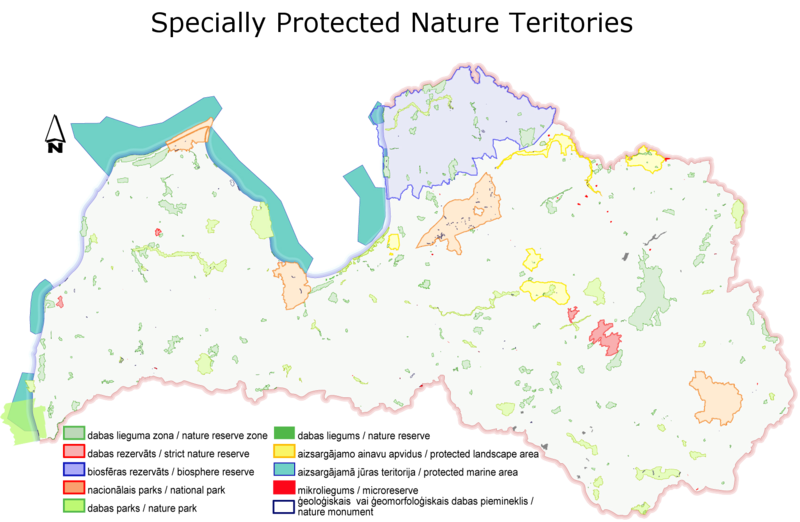 The SOE is defined by Article 10 (6) of the Law on Environment of the Republic of Latvia and is carried out by the "Latvian Environment, Geology and Meteorology Centre"(LEGMC). The SOE must be released at least once every four years and be placed on the homepage of the Ministry of Environmental Protection and Regional Development (MEPRD). The SOE reflects the overall state of environmental health of the country. The currently SOE (National Report on the State of Environment of Latvia 2008–2011) was prepared in 2012 and published on the internet in 2013. The methodology is based on selected indicators and monitoring. The latter consists of state and pollution monitoring carried out by the operators themselves. Another important source is statistics on energy use, production and emissions. Information can be taken by data from international and national projects and from scientific research. As the state of environment in Latvia is relatively good, the SOE report does not provide additional information such as annual or other operative statistics, pollution data bases, or reporting obligations to the UN or EU institutions. Latvia is one of the countries in Europe with the richest biodiversity and an established tradition of nature conservation. One problem is that the majority of databases and reports are made according to specific sector-based fiches. The SOE provides an integrated look at the various problems in simple and understandable language, informs about transboundary pressures, and explains regional differences. The SOE supports political decision-makers at the regional and local level. The SOE also compares developing pressures on the environment with the pressures from nature protection limitations and number of territories through to local government, agriculture and households. Even if there are no large environmental challenges at the country level, there are plenty of smaller regional or local environmental problems. Some of these problems may have an impact on international reporting obligations such as air pollution. For some time the state of environment had been highly evaluated in the majority of assessments prepared by the EEA. Generally Latvia complies with the requirements under the UN MEAS or EU Directives with some small exceptions. During the last decade Latvia has been ranked among the ten environmentally best countries of the world in the Environmental Performance Index (EPI) list. In 2013 the country was ranked second. Latvia is a sparsely populated country with 50% of its territory covered by forests, with a comparably low economy intensity per capita, and a declining number of inhabitants. Sometimes the EPI ranking does not really reflect country environmental footprints. Generally the state of Latvian environment can still be evaluated as "good" because there are no real threats to air quality, water quality, land degradation, municipal services etc. The majority of environmental problems are local, such as a slight exceedance of certain air pollutants in some parts of the capital Riga or some historically polluted spots. Nevertheless the most up-to-date records show that, affected by the financial crises, Latvia had failed to some extent to implement a new and more ambitious and efficient environmental policy, and dropped down in related rankings. The 2014 EPI shows a sharp fall back for 40 locations, but it does not mean that Latvian environment has run in problems. The weaknesses and bottlenecks are well known and Environmental Policy Strategy (EPS) 2014-2020 is already focused on effective actions. Currently the Environmental Policy Strategy (EPS) for the period 2009-2015 was replaced by one covering the 2014-2020 period. This is linked with the Latvian National Development Plan for the period 2014-2020 and focuses on the aims of the EU's 7th Environmental Action Program. EPS implementation is subject to regular controls by the Government and Parliament and scope of control is more oriented to the implementation of tasks. insufficient management of particularly protected areas; and poor actions against aggressive invasive species. All these weaknesses are a heritage from the budget reduction of 2009 connected with limited policy implementation during recent years. In addition, environmental policy is becoming more and more ambitious and pressures from international biodiversity protection or birds' protection targets are growing. Similarly, water quality targets or air protection targets have became rather ambitious and issues such as intercalibration or scientific assessment put more and more stress on smaller countries with lack of sufficient background and capacity on such aspects. As Latvia is one of the Baltic Sea region countries, Baltic marine protection issues wind through all environmental policy documents. Latvian environmental policy should be viewed in the context of the Baltic Marine Environment Protection Commission - Helsinki Commission (HELCOM) or the Action Plan for the EU Strategy for the Baltic Sea Region. In this respect, particularly in relation to the EU Marine Strategy Directive, the initial assessment of the marine environmental status, prepared by the Latvian Institute of Aquatic Ecology in 2012 and published in 2013, is of major importance. Just as in other Baltic Sea States, Latvian environmental policy is much focused on the reduction of land based pollution as a possible source of pollution of the sea. Like other countries with a small territory, Latvia is not in a position to evaluate independently the dynamics of global or regional environment or climate change risks. The territory is small so monitoring is limited, and participation in international projects is rather low. Therefore Latvia highly evaluates global, EU, Nordic and Baltic information systems and evaluations, as they broaden national outlooks and expand the context of the national SOE. The principle problem is being able to harmonise and streamline between global, regional and national monitoring and state of environment evaluation. Latvia is among the countries influenced by transboundary impacts. Long range air pollution impact on local air quality, whilst more than 50% of water resources originate in neighbouring countries. Water resources are therefore under the permanent threat of transboundary pollution and accidents. In particular transboundary water management is still a problematic issue outside the EU. Transboundary water resources also mean that transboundary nutrients run into the Baltic Sea. HELCOM is working on improving the evaluation of this element under the latest Pollution Load Compilation (PLC-6) exercise. Another important problem for Latvia is transit business crossing the country. Even if the infrastructure in the country is well developed, pipelines and railway traffic can cause accidents which can be reduced by proper preparation, risk evaluations and trainings. It is more difficult to reduce air pollution and road-side pollution from heavy and light road transport, as these units cross the country at speed. This puts pressure on the waste and packaging waste management system and municipalities. In addition, an increased interest in the use of maritime space for economic development can cause potential accidents both from maritime transport, as well from offshore energy infrastructure.